How to train a dragon kids bedding and home textile collection with bedding set and textiles accessories with characters from the world of Vikings and wild dragons. 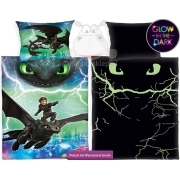 Bedding for children with characters of animated movie How to train your dragon Hiccup – meager posture, awkward son of a tribal chieftain and Night Fury – a dragon named Toothless. Bed sheets, towels and accessories with a dragon Theme and Hiccup in children’s sizes, made of the highest quality certified materials. Kids bedding how to train your dragon, beach towels, baby blankets and accessories with the motif Hiccup and Toothless.